2X - $80.99 Only 5 left! 3X - $80.99 Only 3 left! Quick, what are the Five D's of dodgeball? Too slow, you're already hit! If you think we're being over-dramatic, then maybe you need to wear a real team uniform around to help get you in the ball dodging mood. Try this Plus Size Dodgeball Jersey Costume on for size, and you'll feel just like one of the winners from the hit comedy Dodgeball! Dodge! Duck! Dip! Dive! Dodge!! Those are the Five D's of being a master dodgeballer that you failed earlier to recite before you got you and your entire team wiped out. The great trainer Patches O'Houlihan came up with those five tips, and we aren't going to explain why “Dodge” is in there twice, as it should go without saying. Patches trained a legendary team, the Average Joe's, using only these five essential guidelines, and a sack full of pipe wrenches to throw at them. When they started off, they were a ragtag group of amateurs, but when he had finished with them, they were whipped into a ragtag group of lean, mean, dodging machines! They wore their famous yellow and red uniforms with pride, and if you want to feel how they felt when they became champions, you should wear one, too. 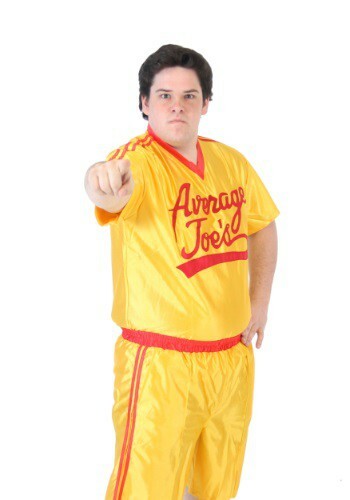 This sporty polyester costume still won't make you a champion dodgeballer, but it's a good place to start. It's officially licensed, so it looks just like the uniforms in the film, and all you need to add is a pair of matching head and wristbands to complete the look. Get your own team of friends in this costume together so you can train for victory on the dodgeball court. And you'd also better memorize those Five D's!